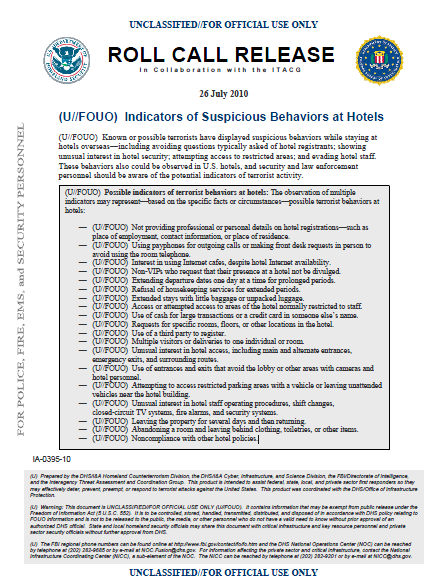 (U//FOUO) Known or possible terrorists have displayed suspicious behaviors while staying at hotels overseas—including avoiding questions typically asked of hotel registrants; showing unusual interest in hotel security; attempting access to restricted areas; and evading hotel staff. These behaviors also could be observed in U.S. hotels, and security and law enforcement personnel should be aware of the potential indicators of terrorist activity. — (U//FOUO) Not providing professional or personal details on hotel registrations—such as place of employment, contact information, or place of residence. — (U//FOUO) Using payphones for outgoing calls or making front desk requests in person to avoid using the room telephone. — (U//FOUO) Interest in using Internet cafes, despite hotel Internet availability. — (U//FOUO) Non-VIPs who request that their presence at a hotel not be divulged. — (U//FOUO) Extending departure dates one day at a time for prolonged periods. — (U//FOUO) Refusal of housekeeping services for extended periods. — (U//FOUO) Extended stays with little baggage or unpacked luggage. — (U//FOUO) Access or attempted access to areas of the hotel normally restricted to staff. — (U//FOUO) Use of cash for large transactions or a credit card in someone else’s name. — (U//FOUO) Requests for specific rooms, floors, or other locations in the hotel. — (U//FOUO) Use of a third party to register. — (U//FOUO) Multiple visitors or deliveries to one individual or room. — (U//FOUO) Unusual interest in hotel access, including main and alternate entrances, emergency exits, and surrounding routes. — (U//FOUO) Use of entrances and exits that avoid the lobby or other areas with cameras and hotel personnel. — (U//FOUO) Attempting to access restricted parking areas with a vehicle or leaving unattended vehicles near the hotel building. — (U//FOUO) Unusual interest in hotel staff operating procedures, shift changes, closed-circuit TV systems, fire alarms, and security systems. — (U//FOUO) Leaving the property for several days and then returning. — (U//FOUO) Abandoning a room and leaving behind clothing, toiletries, or other items. — (U//FOUO) Noncompliance with other hotel policies.